One of the main target species for our trips into the Cheviot Valleys is Ring Ouzel, so hearing a male in full song as you get out of the car is always a good start 🙂 He was singing from a dry stone wall, as his mate hopped around on the grass below and a second pair of ouzels flew over calling. A pair of Whinchats were on a heather covered hillside where a Red Grouse was sunning herself, as Grey Wagtails and Dippers bobbed up and down on midstream rocks, the buzzing song of a Common Redpoll revealed the presence of this attractive finch overhead and a Tree Pipit parachuted down from the sky. A few spots of rain soon cleared to give much brighter conditions and Common Buzzards soared and lazily hovered over the valley tops as a Cuckoo called persistently but remained hidden from view. Then the sky started to darken and a few drops of rain quickly turned into a heavy hailstorm with rumbling thunder adding to the extraordinary atmospheric conditions. The hailstorm moved away down the valley and we made our way back to the car, stopping to admire a male Ring Ouzel feeding only 30m away from us, in a field rendered white with hail. Common Sandpipers bobbed along the stream edge and more Common Buzzards soared against the steep sides of the valley. The trip started with two species that we didn’t find on our Cheviots trip on Thursday; two Brown Hares were sitting by the ‘wader puddle’ and, one of our target species for the day – two Ring Ouzels flew over us, calling, as we started the first of the days walks. Janet soon spotted a juvenile Dipper, and we watched as an adult flew in and fed it. Grey Wagtails were all along the valley, a Spotted Flycatcher was living up to it’s name admirably and a very obliging Tree Pipit perched close to the path. As on Thursday’s trip we heard, but couldn’t see, a Common Redstart. Every so often, something happens that leaves us marveling at nature…and Sunday provided an extraordinary spectacle. As we sat eating our lunch by a small stream, enjoying close views of Lesser Redpoll (a species we’d been hearing all morning although only seeing as small flying dots) I noticed a bird flying across the valley. Initially it looked like a Kestrel – until I raised my binoculars and the pointy-winged, long-tailed, shape resolved into a Cuckoo. It headed down into the heather and was immediately chased by a pair of Meadow Pipits. They pursued it part way across the valley and it dropped out of sight behind the trees…only to reappear a minute later, chased by more pipits. Landing in exactly the same spot in the heather it was chased away for a second time, by four pipits. It rose higher and then began soaring, with the flap-flap-glide that is so characteristic of a Sparrowhawk. More Meadow Pipits joined the attack, presumably revealing their nest locations, and the bird suddenly closed its wings and dropped like a stone, out of sight behind the trees. A minute later and the Cuckoo was heading across the valley again, dropping back in the same spot as previously. This time it was driven off by a pair of Red Grouse, that came charging down from near the summit of the hill, and it flew back and out of sight behind the trees, only to reappear a few seconds later with more Meadow Pipits in tow. In total we watched it make ten visits to what was presumably a Meadow Pipit nest that it was targeting. By the ninth visit it spent several seconds on the ground with angry pipits swirling around it’s head, which we could see sticking up above the heather, and the tenth visit was a prolonged one too. After that it flew back across the valley and didn’t reappear, so perhaps it had been successful in laying an egg in the pipit nest. Thursday brought a trip that I’d been looking forward to for some time; I first met Chris many years ago, while I was Field Trips Officer for the Northumberland and Tyneside Bird Club, so it was going to be a day out with a client who knew me several careers ago. We met up at Church Point and headed inland towards the Cheviot Valleys, a location that features some stunning landscapes; steep-sided valleys, towering hills, mysterious sun-dappled woodland, heather moorland and all that goes with it. As we approached the start of the higher ground, I suggested we check a damp area of an arable field. It’s often good for wading birds and this was no exception; two broods of Lapwing chicks, as well as Oystercatchers and Redshank, were pottering around the edge of the now small puddle. Away to the northwest of our base in southeast Northumberland is the skyline-dominating range of the Cheviot Hills. I collected Susan from Cheviot View and we headed towards the Harthope Valley via the ford at Coldgate Mill. A stop along the road produced Redshank, Oystercatcher, Lapwing and the always impressive Brown Hare. In glorious weather we walked for nearly five hours around various parts of the valley. Curlews sang their eerie song from the heather clad slopes above, Tree Pipits delivered their challenge to rivals, and serenade to potential partners, the descending silvery cadence of Willow Warblers shimmered in the air around us, a Whinchat flitted from rock to heather, and back again, Grey Wagtails lived up to their name – wagging their tails from rocks and fence posts along our route – and the ‘swee-wee-wee-wee-wee’ of Common Sandpipers echoed around the sides of the swiftly flowing stream in the valley bottom. As the afternoon wore on we watched as a Kestrel patrolled the steep valley sides, a Sparrowhawk soared across the valley and a Common Buzzard hovered over a distant plantation. As I collected Jason and Jane for a bespoke day of birdwatching in the beautiful Cheviot valleys, the first few raindrops pattered against the windscreeen of the car. As we headed south from Melkington the rain stopped and visibility improved, so I was sure were in for an excellent day. The day featured all of the species we would expect; Roe Deer, Brown Hare, Raven, Dipper,Grey Wagtail, Common Sandpiper, Tree Pipit, Redstart and Red Grouse amongst many but a few of the regulars put on a really special performance. Cuckoos were calling along the valley but frustratingly staying out of view, until a handsome male flew across the track ahead of us and then perched in full view. A pair of Whinchat provided another highlight as they flitted along a stream, dashing from rock to rock like Grey Wagtails, tails flicking as they sallied across the adjacent hillside. Trips with existing clients are always a pleasure, not only because it’s very gratifying to get a booking from someone we’ve taken out before, but also because we already have shared memories. I had 3 things vivid in my mind from when I took Pete and Janet out in September 2008 – it rained, we saw 11 adult Mediterranean Gulls on the beach at Newbiggin and Janet found an Otter. As we approached Harwood a Roe Deer crossed the track, walked into the trees and then stopped to watch us. This was the first of 11 that we saw on our journey through the forest (well, it was about 11, and if I say 11, it’ll help the punchline to this post!). Harwood again produced memorable sightings; Roe Deer, Tree Pipit, at least 3 Cuckoos, Siskins, plenty of Crossbills, more Roe Deer and a mouth-wateringly attractive male Common Redstart. A list of species can never really do justice to just how good encounters with wildlife can be though; as 2 Roe Deer bounded across the clearfell area beside the track, 2 Cuckoos were engaged in a frantic chase, calling frequently and mobbed by Meadow Pipits every time they left the safety of the trees, while the male Redstart flicked along the edge of a nearby plantation, red tail shivering as he perched on a tree stump, black face contrasting with his white forehead and supercilium, the subtle grey of his crown and mantle and the orangy-red of his breast. As we tucked in to our picnic lunch, overlooking a very calm North Sea, the first drops of icy rain began to patter down. Then, a comment from Janet to set the pulse racing “I’m sure I just saw a fin”. With such calm water the sudden appearance of black shapes at the surface stood out, and Janet had found yet another exciting mammal on a NEWT safari. This time it wasn’t the sleek, sinuous predator of our lakes and rivers, but another sleek, sinuous predator. We watched for several minutes as the pod of Bottlenose Dolphins moved slowly south. At least 6 animals, including a very small calf, they surfaced lazily every 30seconds or thereabouts as I texted observers further south to let them know what was coming. I’ve been a general naturalist since an early age, but birdwatching has been the thing that has always gripped my imagination. As a wildlife guide though, is that really enough? That’s a question that seems to arise occasionally on internet forums. I decided at an early stage of NEWT that I needed a much broader and deeper knowledge, so I spend a lot of time studying things that once upon a time (I’m ashamed to admit) I would have ignored, or even not noticed. Every day that I spend with clients, I make an effort to learn from them, whilst imparting my own knowledge, skills and understanding of what we encounter. Yesterday was the first of two days out with the winners of last year’s Birdwatching Northumberland prize draw. After collecting Andy and Jean from the Bamburgh Castle Inn our destination was the Harthope Valley in the Cheviots. It’s one of our favourite locations; stunning landscape, interesting geology and, of course, excellent wildlife. As we reached the start of the valley we stopped to check on a Dipper nest, and there was one of the adults sitting on a rock in the river, so close that we didn’t need binoculars. Further upstream we watched a pair of Grey Wagtails, eventually locating their nest in the tangled exposed roots of a riverside tree, before setting off in search of Ring Ouzels. It wasn’t too long before we heard a singing male, but he remained stubbornly out of sight. As we climbed higher up the valley the song seemed to be coming from somewhere else and careful scanning of the area revealed our quarry, perched on the remnants of a dry stone wall. A pair of Red Grouse, with at least 7 chicks, were very obliging and a pair of Whinchat were flitting around in the heather. After lunch we were treated to more Grey Wagtails, including a bird singing and displaying high overhead, and these were a real highlight of the day, a singing Dipper, Tree Pipit, Redstart, Cuckoo, a plethora of Willow Warblers and the shivering trill of a Wood Warbler. 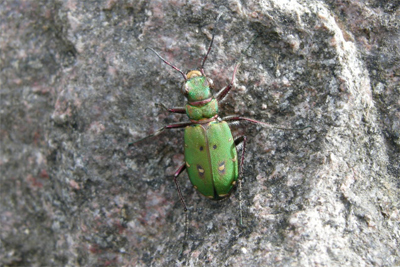 Andy was keen to take a photograph of a Green Tiger Beetle and, eventually, one sat still for long enough to allow him to get close to it. 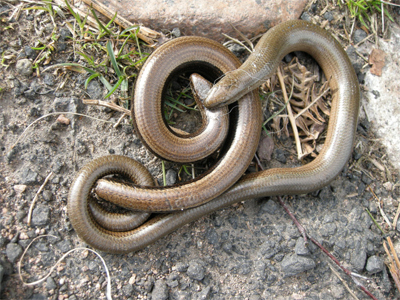 The non-bird highlight of the day though came as we walked back to the Land Rover; a pair of Slow Worms locked in a mating embrace. A remarkable end to an excellent day captured on camera by Andy, who kindly sent me the images to add to our blog. 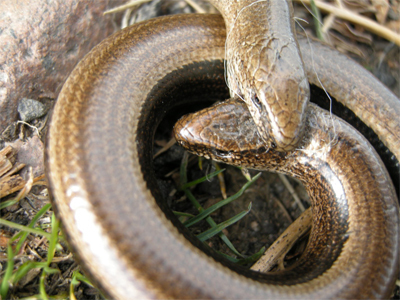 This embrace can last for up to 10 hours!